Improve your harvest efficiency, and subsequent operations like spraying, with the heaviest land rollers on the market from Rite Way. The 6 models that we provide at Flaman come in a variety of lengths from 32’ to 89’, feature 42” diameter drums and can be easily switched from transport to working mode in minutes thanks to the patented FORWARD™ Unfolding System. The unfolding system also allows you to pull multiple pieces of equipment in tandem. Additional features include: adjustable hitch height, dual wing transport tires, over-center wing lockups, triple lip seal bearings, taper lock replaceable drum shafts, safety chains and a light package. 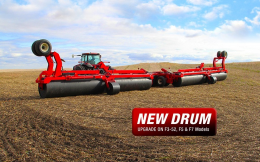 The roller’s Large diameter drums effectively smooth your field without the worry of compaction, while the shorter, independently floating segments apply uniform pressure no matter what the terrain. This combination results in better germination and seed to soil contact. Flaman is always on the look out for innovative product to help you streamline your operation. Our team of farm sales equipment experts, located at our 9 dealerships throughout Alberta, Saskatchewan and Manitoba, are here to guide you through each step of the process to find equipment that is right for you and your farm. Visit your nearest location today to inquire about our land rollers, or to find out more about our full selection of farm implements.